Edward Fisher, Robin Youngs, Musheer Hussain, Jonathan Fishman,	The Journal of Laryngology & Otology, Volume 131 Issue 2, p 95. A Mishra, A Pandey, S C Mishra,	The Journal of Laryngology & Otology, Volume 131 Issue 9, pp 752-759. Z C Lou, Z H Lou,	The Journal of Laryngology & Otology, Volume 131 Issue 7, pp 564-571. E Fong, M Garcia, C M Woods, E Ooi,	The Journal of Laryngology & Otology, Volume 131 Supplement 1, pp S2-S11. J Jervis-Bardy, A S Carney, R Duguid, A J Leach,	The Journal of Laryngology & Otology, Volume 131 Supplement 2, pp S2-S11. G James, D N P Thompson,	The Journal of Laryngology & Otology, Volume 131 Issue 11, pp 940-945. The Journal of Laryngology & Otology, Volume 131 Issue 2, pp 96-105. Z Jiang, Z Lou, Z Lou,	The Journal of Laryngology & Otology, Volume 131 Issue 6, pp 472-475. B Attlmayr, S G Derbyshire, A V Kasbekar, A C Swift,	The Journal of Laryngology & Otology, Volume 131 Issue 4, pp 284-289. Benign positional vertigo and endolymphatic hydrops: what is the connection? A F Jahn,	The Journal of Laryngology & Otology, Volume 131 Issue 8, pp 658-660. R Powell, A Wearden, S M Pardesi, K Green,	The Journal of Laryngology & Otology, Volume 131 Issue 3, pp 190-201. D Hamilton, M K Khan, J O'hara, V Paleri,	The Journal of Laryngology & Otology, Volume 131 Issue 1, pp 3-7. A Ellinas, P Jervis, G Kenyon, L M Flood,	The Journal of Laryngology & Otology, Volume 131 Issue 4, pp 290-297. V E Crolley, N Gibbins,	The Journal of Laryngology & Otology, Volume 131 Issue 3, pp 202-208. E Esen, N Bayar Muluk, N Altintoprak, K Ipci, C Cingi,	The Journal of Laryngology & Otology, Volume 131 Issue 6, pp 476-479. A Gros, V Manera, C A De March, N Guevara, A König, L Friedman, P Robert, J Golebiowski, R David,	The Journal of Laryngology & Otology, Volume 131 Issue 7, pp 572-579. C Meller, T E Havas,	The Journal of Laryngology & Otology, Volume 131 Supplement 2, pp S12-S18. K E Stewart, D R K Smith, S L Woolley,	The Journal of Laryngology & Otology, Volume 131 Issue 8, pp 661-666. Laryngomalacia: is there an evidence base for management? C McCaffer, K Blackmore, L M Flood,	The Journal of Laryngology & Otology, Volume 131 Issue 11, pp 946-954. L Harrison, R Corbridge,	The Journal of Laryngology & Otology, Volume 131 Issue 7, pp 580-584. E Keane, E C Francis, É Ó Catháin, H Rowley,	The Journal of Laryngology & Otology, Volume 131 Issue 6, pp 480-486. A Hui, P Hong, M Bezuhly,	The Journal of Laryngology & Otology, Volume 131 Issue 7, pp 585-592. A Price, R Eccles,	The Journal of Laryngology & Otology, Volume 131 Issue 10, pp 846-852. C Swords, M E Smith, J D Wasson, A Qayyum, J R Tysome,	The Journal of Laryngology & Otology, Volume 131 Issue 2, pp 106-112. A V Kasbekar, E J Combellack, S G Derbyshire, A C Swift,	The Journal of Laryngology & Otology, Volume 131 Issue 1, pp 8-12. E Carmel, J H Curotta, A T Cheng,	The Journal of Laryngology & Otology, Volume 131 Supplement 1, pp S12-S17. J R Qualliotine, J A Califano, R J Li, D Gold, B Messing, G Lee, P Ha, C Fakhry,	The Journal of Laryngology & Otology, Volume 131 Issue 9, pp 760-767. I-C Nam, J-S Bae, S-H Lee, J-O Park, S-Y Kim, Y-H Joo, Y-H Park, D-I Sun,	The Journal of Laryngology & Otology, Volume 131 Issue 10, pp 853-859. S W Song, B C Jun, H Kim,	The Journal of Laryngology & Otology, Volume 131 Issue 3, pp 209-214. A Yenigun, A Elbay, A M Hafiz, O Ozturan,	The Journal of Laryngology & Otology, Volume 131 Issue 9, pp 768-772. C M Clark, H H Patel, S G Kanekar, H Isildak,	The Journal of Laryngology & Otology, Volume 131 Issue 4, pp 298-302. Y Zhang, S Wang, Y Zheng, A Liu,	The Journal of Laryngology & Otology, Volume 131 Issue 10, pp 860-865. J Godbehere, S D Carr, J Moraleda, P Edwards, J Ray,	The Journal of Laryngology & Otology, Volume 131 Issue 8, pp 667-670. C Rajakumar, P C Doyle, M G Brandt, C C Moore, A Nichols, J H Franklin, J Yoo, K Fung,	The Journal of Laryngology & Otology, Volume 131 Issue 1, pp 13-18. T-T Ng, D Diamantaras, J Priestley, J Redman, N De Silva, V Mahanta,	The Journal of Laryngology & Otology, Volume 131 Supplement 1, pp S18-S28. H Yu, H Sun, Z Wang, Y Liu,	The Journal of Laryngology & Otology, Volume 131 Issue 11, pp 955-960. Y Ozkul, M Songu, K Onal, A Imre, S Arslanoglu, E Horoz, F Bayrak, E Pinar,	The Journal of Laryngology & Otology, Volume 131 Issue 2, pp 113-116. A J Wood, L Zhou, S Wilkinson, R G Douglas,	The Journal of Laryngology & Otology, Volume 131 Supplement 2, pp S19-S24. P Piromchai, I Ioannou, S Wijewickrema, P Kasemsiri, J Lodge, G Kennedy, S O'Leary,	The Journal of Laryngology & Otology, Volume 131 Supplement 1, pp S29-S35. Y Güldiken, B Polat, N Enver, L Aydemir, Ş Çomoğlu, K S Orhan,	The Journal of Laryngology & Otology, Volume 131 Issue 6, pp 487-491. D Youssef, S Vasani, J Marquess, A Cervin,	The Journal of Laryngology & Otology, Volume 131 Supplement 2, pp S25-S28. C Heining, R Banga, R Irving, C Coulson, P Monksfield,	The Journal of Laryngology & Otology, Volume 131 Issue 11, pp 961-964. S Bhasker, S Mallick, R Benson, V Bhanuprasad, A Sharma, A Thakar,	The Journal of Laryngology & Otology, Volume 131 Issue 1, pp 19-25. O Ergun, M D Bajin, M F Sargon, L Sennaroglu,	The Journal of Laryngology & Otology, Volume 131 Issue 8, pp 671-675. L Park, N Lilic, B Addison, R Patel,	The Journal of Laryngology & Otology, Volume 131 Issue 4, pp 303-308. V Bettadahalli, A Chakravarti,	The Journal of Laryngology & Otology, Volume 131 Issue 9, pp 773-778. S Kaya, E Selimoğlu, S Cureoğlu, M A Selimoğlu,	The Journal of Laryngology & Otology, Volume 131 Issue 10, pp 866-870. Endoscopic ear surgery: a hot topic? S Mitchell, C Coulson,	The Journal of Laryngology & Otology, Volume 131 Issue 2, pp 117-122. O Ismi, Y Y Karabulut, K K Bal, Y Vayisoglu, M Unal,	The Journal of Laryngology & Otology, Volume 131 Issue 3, pp 215-220. F B Palabiyik, K Hacikurt, Z Yazici,	The Journal of Laryngology & Otology, Volume 131 Issue 1, pp 26-31. R S Lim, L Evans, A P George, N de Alwis, P Stimpson, S Merriel, C E B Giddings, B Billah, J A Smith, A Safdar, E Sigston,	The Journal of Laryngology & Otology, Volume 131 Supplement 1, pp S36-S40. H Kanona, I Rana, C Offiah, N Patel,	The Journal of Laryngology & Otology, Volume 131 Issue 6, pp 492-496. C Schmidt, N Potter, S Porceddu, B Panizza,	The Journal of Laryngology & Otology, Volume 131 Supplement 2, pp S29-S34. G B Singh, S Ranjan, R Arora, S Kumar,	The Journal of Laryngology & Otology, Volume 131 Issue 2, pp 123-127. E Tahir, M D Bajin, G Atay, B Ö Mocan, L Sennaroğlu,	The Journal of Laryngology & Otology, Volume 131 Issue 8, pp 676-683. K S Mikkelsen, T Ovesen, C Z Swan,	The Journal of Laryngology & Otology, Volume 131 Issue 4, pp 309-315. J Mejzlik, P Celakovsky, L Tucek, M Kotulek, A Vrbacky, P Matousek, L Stanikova, T Hoskova, A Pazs, P Mittu, V Chrobok,	The Journal of Laryngology & Otology, Volume 131 Issue 9, pp 779-784. S M D Schneiders, J W Rainsbury, E F Hensen, R M Irving,	The Journal of Laryngology & Otology, Volume 131 Issue 7, pp 593-597. Are questionnaires reliable in diagnosing sleep-disordered breathing in university students? E Migacz, A Wichniak, W Kukwa,	The Journal of Laryngology & Otology, Volume 131 Issue 11, pp 965-971. O Surmelioglu, L Sencar, S Ozdemir, O Tarkan, M Dagkiran, N Surmelioglu, U Tuncer, S Polat,	The Journal of Laryngology & Otology, Volume 131 Issue 3, pp 221-226. D Dönmez, E Giotakis, W G Hosemann, T S Kühnel, B Hirt, R K Weber,	The Journal of Laryngology & Otology, Volume 131 Issue 10, pp 871-879. H M Htun, S L Mui, C Williams, P S Hans,	The Journal of Laryngology & Otology, Volume 131 Issue 1, pp 32-36. W-K Low, S Xu,	The Journal of Laryngology & Otology, Volume 131 Issue 8, pp 684-687. Q L Zhao, L Yu, L L Zhi, P Jin, X X Zi, L Zhao, A Li, Y Y Tu, L Shi, H P Zhang,	The Journal of Laryngology & Otology, Volume 131 Issue 10, pp 880-888. A D Hinton-Bayre, K Noonan, S Ling, S Vijayasekaran,	The Journal of Laryngology & Otology, Volume 131 Supplement 2, pp S35-S40. M Kameswaran, K Natarajan, M Parthiban, P V Krishnan, S Raghunandhan,	The Journal of Laryngology & Otology, Volume 131 Issue 9, pp 785-792. Results of revision myringoplasty: are they different to those of primary myringoplasty? P Prinsley,	The Journal of Laryngology & Otology, Volume 131 Issue 4, pp 316-318. H H Arslan, S Cebeci, U Yildizoglu, S Pusat, F Yavuz,	The Journal of Laryngology & Otology, Volume 131 Issue 6, pp 497-500. L Wang, Z Wang, F Gao, K A Peng,	The Journal of Laryngology & Otology, Volume 131 Issue 7, pp 598-601. D-J Hyun, Y-H Joo, M-S Kim,	The Journal of Laryngology & Otology, Volume 131 Issue 11, pp 972-976. D Chandran, C Woods, S Ullah, E Ooi, T Athanasiadis,	The Journal of Laryngology & Otology, Volume 131 Supplement 1, pp S41-S46. M Itani, Y Koaik, A Sabri,	The Journal of Laryngology & Otology, Volume 131 Issue 3, pp 227-231. T Kujala, O-P Alho, A Kristo, M Uhari, M Renko, T Pokka, P Koivunen,	The Journal of Laryngology & Otology, Volume 131 Issue 2, pp 128-137. S Geerse, F A Ebbens, M J F de Wolf, E van Spronsen,	The Journal of Laryngology & Otology, Volume 131 Issue 2, pp 138-143. G Eskiizmir, E Ozgur, G Karaca, P Temiz, N Hacioglu Yanar, B Cengiz Ozyurt,	The Journal of Laryngology & Otology, Volume 131 Issue 10, pp 889-894. N M Phillips, E Matthews, C Altmann, J Agnew, H Burns,	The Journal of Laryngology & Otology, Volume 131 Supplement 2, pp S41-S47. A Britze, M L Møller, T Ovesen,	The Journal of Laryngology & Otology, Volume 131 Issue 4, pp 319-328. M Arif, M Sadlier, D Rajenderkumar, J James, T Tahir,	The Journal of Laryngology & Otology, Volume 131 Issue 6, pp 501-507. 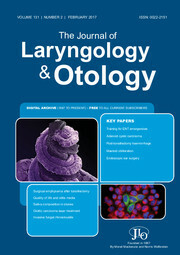 L Cheung, V Pattni, P Peacock, S Sood, D Gupta,	The Journal of Laryngology & Otology, Volume 131 Issue 11, pp 977-981. S R Teh, S Ranguis, P Fagan,	The Journal of Laryngology & Otology, Volume 131 Supplement 1, pp S47-S49. J Wu, H R Zang, T Wang, B Zhou, J Y Ye, Y C Li, D M Han,	The Journal of Laryngology & Otology, Volume 131 Issue 1, pp 37-43. A Soto-Varela, A Faraldo-García, M Del-Río-Valeiras, M Rossi-Izquierdo, I Vaamonde-Sánchez-Andrade, P Gayoso-Diz, A Lirola-Delgado, S Santos-Pérez,	The Journal of Laryngology & Otology, Volume 131 Issue 3, pp 232-238. M Gruber, C Brown, M Mahadevan, M Neeff,	The Journal of Laryngology & Otology, Volume 131 Issue 8, pp 688-695. K F Moreno, R S Cornelius, F V Lucas, J Meinzen-Derr, Y J Patil,	The Journal of Laryngology & Otology, Volume 131 Issue 9, pp 793-800. V A Patel, B S Oberman, T T Zacharia, H Isildak,	The Journal of Laryngology & Otology, Volume 131 Issue 7, pp 602-607. L Stepan, C-K L Shaw, S Oue,	The Journal of Laryngology & Otology, Volume 131 Supplement 1, pp S50-S56. R F Bento, J C Cisneros, A C De Oliveira Fonseca,	The Journal of Laryngology & Otology, Volume 131 Issue 2, pp 144-149. M Suzuki, Y Nakamura, S Ozaki, M Yokota, S Murakami,	The Journal of Laryngology & Otology, Volume 131 Issue 8, pp 696-701. L-P Zhang, H-L Chen,	The Journal of Laryngology & Otology, Volume 131 Issue 1, pp 44-50. S Mulazimoglu, R Flury, S Kapila, T Linder,	The Journal of Laryngology & Otology, Volume 131 Issue 4, pp 329-333. A Ahmadzadeh, M Daraei, M Jalessi, A A Peyvandi, E Amini, L A Ranjbar, A Daneshi,	The Journal of Laryngology & Otology, Volume 131 Issue 10, pp 895-899. M S Ansari, R Rangasayee, M A H Ansari,	The Journal of Laryngology & Otology, Volume 131 Issue 3, pp 239-244. G J Kim, S Yoo, S Han, J Bu, Y Hong, D-K Kim,	The Journal of Laryngology & Otology, Volume 131 Issue 9, pp 801-804. M Teixido, A Baker, H Isildak,	The Journal of Laryngology & Otology, Volume 131 Issue 6, pp 508-513. C Q Phua, W X Yeo, C Su, P K H Mok,	The Journal of Laryngology & Otology, Volume 131 Issue 11, pp 982-986. G Harris, C O'Meara, C Pemberton, J Rough, P Darveniza, S Tisch, I Cole,	The Journal of Laryngology & Otology, Volume 131 Supplement 2, pp S48-S52. B Waller, R Larsen-Reindorf, M Duah, J Opoku-Buabeng, B M Edwards, D Brown, J Moyer, M Prince, G J Basura,	The Journal of Laryngology & Otology, Volume 131 Issue 7, pp 608-613. K Yan, M Lv, E Xu, F Fan, Y Lei, W Liu, X Yu, N Li, L Shi,	The Journal of Laryngology & Otology, Volume 131 Issue 9, pp 805-808. P Andrews, J Joseph, C-H Li, L Nip, T Jacques, T Leung,	The Journal of Laryngology & Otology, Volume 131 Issue 8, pp 702-706. H Gur, Y Alimoglu, U Duzenli, S Korkmaz, S Inan, L Olgun,	The Journal of Laryngology & Otology, Volume 131 Issue 3, pp 245-252. A Schwartz, D Kaplan, V Rosenzweig, M Klein, B F Gruenbaum, S E Gruenbaum, M Boyko, A Zlotnik, E Brotfain,	The Journal of Laryngology & Otology, Volume 131 Issue 10, pp 900-906. F Aksoy, A Yenigun, S S Goktas, O Ozturan,	The Journal of Laryngology & Otology, Volume 131 Issue 1, pp 51-55. Y D Huang, H W Yu, S W Xia, Z H Kang, Y S He, D Y Han,	The Journal of Laryngology & Otology, Volume 131 Issue 2, pp 150-154. M H Abou-Elew, N A Hosni, E A Obaid, A H Ewida,	The Journal of Laryngology & Otology, Volume 131 Issue 4, pp 334-340. S I Kosyakov, J V Minavnina, J S Phillips, M W Yung,	The Journal of Laryngology & Otology, Volume 131 Issue 6, pp 514-517. T Singh, V Taneja, K Kulendra, M Farr, J Robinson, D Rejali,	The Journal of Laryngology & Otology, Volume 131 Issue 7, pp 614-619. E G Gardner, J Sappington, M A Arriaga, S P Kanotra,	The Journal of Laryngology & Otology, Volume 131 Issue 11, pp 987-990. X-D Xu, J Hu, Q Zhang, Y Zhang, X-T Zhang, Y-F Chen, M Xu,	The Journal of Laryngology & Otology, Volume 131 Issue 1, pp 56-63. L Tian, R An, J Zhang, Y Sun, R Zhao, M Liu,	The Journal of Laryngology & Otology, Volume 131 Issue 3, pp 253-258. A Hussein, H Fathy, S M Amin, N Elsisy,	The Journal of Laryngology & Otology, Volume 131 Issue 10, pp 907-913. S A R Nouraei, A Hudovsky, J S Virk, H A Saleh,	The Journal of Laryngology & Otology, Volume 131 Issue 4, pp 341-346. K Hashimoto, K Tsuzuki, K Okazaki, M Sakagami,	The Journal of Laryngology & Otology, Volume 131 Issue 7, pp 620-626. S Bola, M Rashid, S Hickey,	The Journal of Laryngology & Otology, Volume 131 Issue 9, pp 809-812. V Ganesh, A Banigo, A E L McMurran, M Shakeel, B Ram,	The Journal of Laryngology & Otology, Volume 131 Issue 11, pp 991-996. N Mehta, R J Williams, M E Smith, A Hall, J C Hardman, L Cheung, M P Ellis, J M Fussey, R Lakhani, O McLaren, P C Nankivell, N Sharma, W Yeung, S Carrie, C Hopkins,	The Journal of Laryngology & Otology, Volume 131 Issue 6, pp 518-522. T Harju, J Numminen,	The Journal of Laryngology & Otology, Volume 131 Issue 2, pp 155-161. K-J Cheng, Y-Y Xu, M-L Zhou, S-H Zhou, S-Q Wang,	The Journal of Laryngology & Otology, Volume 131 Issue 8, pp 707-713. A T Ihsan, K Ranjana,	The Journal of Laryngology & Otology, Volume 131 Issue 1, pp 64-68. P W Doyle, I Beegun, H A Saleh,	The Journal of Laryngology & Otology, Volume 131 Issue 4, pp 347-349. Does saliva composition affect the formation of sialolithiasis? S A Schrøder, P Homøe, N Wagner, A Bardow,	The Journal of Laryngology & Otology, Volume 131 Issue 2, pp 162-167. L C Goh, E D Shakri, H Y Ong, S Mustakim, M M Shaariyah, W S J Ng, A B Zulkiflee,	The Journal of Laryngology & Otology, Volume 131 Issue 9, pp 813-816. J Chen, Y Zhou, J Nie, Y Wang, L Zhang, Q Shi, H Tan, W Kong,	The Journal of Laryngology & Otology, Volume 131 Issue 6, pp 523-528. G S M Freire, J H Z dos Santos, P A Rolón, G B Pinheiro, A L L Sampaio,	The Journal of Laryngology & Otology, Volume 131 Issue 7, pp 627-630. R A Crosbie, W A Clement, H Kubba,	The Journal of Laryngology & Otology, Volume 131 Issue 8, pp 714-718. W Mulwafu, D R Strachan, R Bartlett, C Caron,	The Journal of Laryngology & Otology, Volume 131 Issue 10, pp 914-918. Is ultrasonography-guided drainage a safe and effective alternative to incision and drainage for deep neck space abscesses? P Dabirmoghaddam, A Mohseni, Z Navvabi, A Sharifi, S Bastaninezhad, A Safaei,	The Journal of Laryngology & Otology, Volume 131 Issue 3, pp 259-263. E Sahin, D Dizdar, M E Dinc, A A Cirik,	The Journal of Laryngology & Otology, Volume 131 Issue 11, pp 997-1001. A R Singh, A Rai, M Aftab, S Jain, M Singh,	The Journal of Laryngology & Otology, Volume 131 Issue 1, pp 69-76. M M Verkerk, R Wagner, R Fishchuk, J J Fagan,	The Journal of Laryngology & Otology, Volume 131 Issue 11, pp 1002-1009. M Y Lan, J P Park, Y J Jang,	The Journal of Laryngology & Otology, Volume 131 Issue 6, pp 529-533. J D Constable, G A Moghul, P Leighton, S J Schofield, M Daniel,	The Journal of Laryngology & Otology, Volume 131 Issue 7, pp 631-639. C Haremza, N Klopp-Dutote, V Strunski, C Page,	The Journal of Laryngology & Otology, Volume 131 Issue 10, pp 919-924. M Binar, T M Akcam, O Karakoc, R I Sagkan, U Musabak, M Gerek,	The Journal of Laryngology & Otology, Volume 131 Issue 8, pp 719-727. Transoral laser resection of glottic carcinoma: what is the significance of anterior commissure involvement? K A Stephenson, J J Fagan,	The Journal of Laryngology & Otology, Volume 131 Issue 2, pp 168-172. E A Nicolli, R M Carey, D Farquhar, S Haft, K P Alfonso, N Mirza,	The Journal of Laryngology & Otology, Volume 131 Issue 3, pp 264-267. N N Venkatesan, C M Johnson, M T Siddiqui, D J Cates, M A Kuhn, G N Postma, P C Belafsky,	The Journal of Laryngology & Otology, Volume 131 Issue 4, pp 350-356. O Ilan, E-L Marcus, Y Cohen, T Farkash, R Levy, A Sasson, C Adelman,	The Journal of Laryngology & Otology, Volume 131 Issue 9, pp 817-822. U C Megwalu,	The Journal of Laryngology & Otology, Volume 131 Issue 2, pp 173-176. S Hosokawa, K Sugiyama, G Takahashi, S Takebayashi, H Mineta,	The Journal of Laryngology & Otology, Volume 131 Issue 1, pp 77-82. N Gibbins, R Awad, S Harris, A Aymat,	The Journal of Laryngology & Otology, Volume 131 Issue 4, pp 357-362. K Luu, L Straatman, D Nakku, B Westerberg, N Carter, M Clark,	The Journal of Laryngology & Otology, Volume 131 Issue 11, pp 1010-1016. M Erlem, N Klopp-Dutote, A Biet-Hornstein, V Strunski, C Page,	The Journal of Laryngology & Otology, Volume 131 Issue 10, pp 925-929. S Chan, G Siou, A Welch, S Powell,	The Journal of Laryngology & Otology, Volume 131 Issue 7, pp 640-644. M Andratschke, H Hagedorn,	The Journal of Laryngology & Otology, Volume 131 Issue 6, pp 534-540. D Mendis, J A Anderson,	The Journal of Laryngology & Otology, Volume 131 Issue 8, pp 728-735. S D Sharma, S L Gupta, M Wyatt, D Albert, B Hartley,	The Journal of Laryngology & Otology, Volume 131 Issue 3, pp 268-272. U C Megwalu, A T Saini,	The Journal of Laryngology & Otology, Volume 131 Issue 1, pp 83-87. D Wu, X Li, X Guo, J Qin, S Li,	The Journal of Laryngology & Otology, Volume 131 Issue 4, pp 363-367. Did the ‘croaky voice’ public health campaign have any impact on the stage of laryngeal cancer at presentation in 84 cases from the Humber and Yorkshire Coast Cancer Network? S G Mistry, J Jose, V Allgar,	The Journal of Laryngology & Otology, Volume 131 Issue 8, pp 736-739. H Keppler, S Degeest, I Dhooge,	The Journal of Laryngology & Otology, Volume 131 Issue 11, pp 1017-1025. T Zahoor, R Dawson, M Sen, Z Makura,	The Journal of Laryngology & Otology, Volume 131 Issue 6, pp 541-545. L Otruba, P Schalek, Z Hornáčková,	The Journal of Laryngology & Otology, Volume 131 Issue 7, pp 645-649. R Lenzi, M Marchetti, L Muscatello,	The Journal of Laryngology & Otology, Volume 131 Issue 4, pp 368-371. S X Li, M A Polacco, B J Gosselin, L X Harrington, A J Titus, J A Paydarfar,	The Journal of Laryngology & Otology, Volume 131 Issue 8, pp 740-744. Travelling for treatment; does distance and deprivation affect travel for intensity-modulated radiotherapy in the rural setting for head and neck cancer? B Cosway, L Douglas, N Armstrong, A Robson,	The Journal of Laryngology & Otology, Volume 131 Issue 6, pp 546-548. N Siupsinskiene, I Katutiene, V Jonikiene, D Janciauskas, S Vaitkus,	The Journal of Laryngology & Otology, Volume 131 Issue 6, pp 549-556. A M O'Kane, C P Jackson, M Mahadevan, C Barber,	The Journal of Laryngology & Otology, Volume 131 Supplement 2, pp S53-S56. S Chawla, J Bowman, M Gandhi, B Panizza,	The Journal of Laryngology & Otology, Volume 131 Supplement 1, pp S57-S61. A Smith, I Gutteridge, D Elliott, M Cronin,	The Journal of Laryngology & Otology, Volume 131 Supplement 2, pp S57-S61. R Bannon, R Gohil, J Manickavasagam,	The Journal of Laryngology & Otology, Volume 131 Issue 9, pp 823-826. K Pujary, A C Agarwal, R Balakrishnan, A Bhandarkar,	The Journal of Laryngology & Otology, Volume 131 Issue 10, pp 930-932. J Golding, P Kirkland, D Howlett,	The Journal of Laryngology & Otology, Volume 131 Issue 9, pp 827-829. R A Crosbie, T Kunanandam,	The Journal of Laryngology & Otology, Volume 131 Issue 2, pp 177-180. J Dixon, I Zammit-Maempel, J Hill,	The Journal of Laryngology & Otology, Volume 131 Issue 3, pp 273-279. C P Yiannakis, R B Townsley, I G Smillie, G L Picozzi,	The Journal of Laryngology & Otology, Volume 131 Issue 1, pp 88-89. H Mohammed, L Masterson, R Nassif,	The Journal of Laryngology & Otology, Volume 131 Issue 7, pp 650-654. M A Taube, G M Potter, S K Lloyd, S R Freeman,	The Journal of Laryngology & Otology, Volume 131 Issue 2, pp 181-184. R Shodo, Y Sato, H Ota, A Horii,	The Journal of Laryngology & Otology, Volume 131 Issue 11, pp 1026-1029. R Heyes, A G Aulakh, R K Lingam, T Tatla,	The Journal of Laryngology & Otology, Volume 131 Issue 10, pp 933-936. L X Ngui, L S Wong, G Shashi, M N Abu Bakar,	The Journal of Laryngology & Otology, Volume 131 Issue 9, pp 830-833. V Pinto, P G Morselli, D Tassone, O Piccin,	The Journal of Laryngology & Otology, Volume 131 Issue 9, pp 834-837. D Yamauchi, Y Hara, H Hidaka, T Kawase, Y Katori,	The Journal of Laryngology & Otology, Volume 131 Issue 8, pp 745-748. E Watts, H R F Powell, S R Saeed, R M Irving,	The Journal of Laryngology & Otology, Volume 131 Issue 6, pp 557-560. M M Dungarwalla, A W Barrett, A Gulati,	The Journal of Laryngology & Otology, Volume 131 Issue 9, pp 838-841. Robert Nash, Natasha Amiraraghi, Ruhuta Roplekar, May Yaneza, Shayan Ansari, Charlie Huins, Anthony Narula, Haytham Kubba, Craig Murray, Angus Cain, Gillian McDougall,	The Journal of Laryngology & Otology, Volume 131 Issue 2, pp -. The Journal of Laryngology & Otology, Volume 131 Issue 6, pp -. Elfy B Chevretton, Sherif Haikel, Ann Sandison, Steve Connor, Ata Siddiqui,	The Journal of Laryngology & Otology, Volume 131 Issue 9, pp -. The Journal of Laryngology & Otology, Volume 131 Issue 9, pp -. The Journal of Laryngology & Otology, Volume 131 Issue 9, p .
A Walker, P Surda, C Hopkins,	The Journal of Laryngology & Otology, Volume 131 Issue 3, pp 280-281. Xu-Dan Lou, Zi-Han Lou,	The Journal of Laryngology & Otology, Volume 131 Issue 1, pp 90-91. S G Mistry, D R Strachan, E L Loney,	The Journal of Laryngology & Otology, Volume 131 Issue 3, pp 281-282. S D Carr, D R Strachan, C H Raine,	The Journal of Laryngology & Otology, Volume 131 Issue 1, p 91. J Y Soh, M Thalayasingam, S Ong, E X L Loo, L P Shek, S S Chao,	The Journal of Laryngology & Otology, Volume 131 Issue 2, p 187.